We are now in the very final stages of the most remarkable era of alchemy in the history of finance. This cycle started in 1913 with the creation of the Fed and had its death knell in 1971 when Nixon took away the gold backing of the dollar. It has been a long and slow 50 year death of the world economy and the patient has only been kept alive due to the creation of fake money, fake assets, fake (paper) gold, fake wealth, fake valuations, fake balance sheets, fake bankers, fake politicians all built on a colossal mountain of fake debt. What will be the trigger for the coming biggest financial crisis in history? There are so many time bombs around the globe that it really doesn’t matter where and how it starts. Because when it starts, there will be a chain reaction that will lead to the most spectacular economic fireworks in history. Central banks around the world have already set the coming fall in motion. What has kept the world going for so long, in spite of being bankrupt, is the massive liquidity that all central banks have added to the system. The world economy can only grow, albeit artificially, by a constant injection of liquidity. Without that the patient would die quickly. This has created an illusion of growth but all that has grown is debt. In real terms the world economy is hardly growing and how could it just based on fake money. But central banks are now creating the perfect situation for the coming collapse. 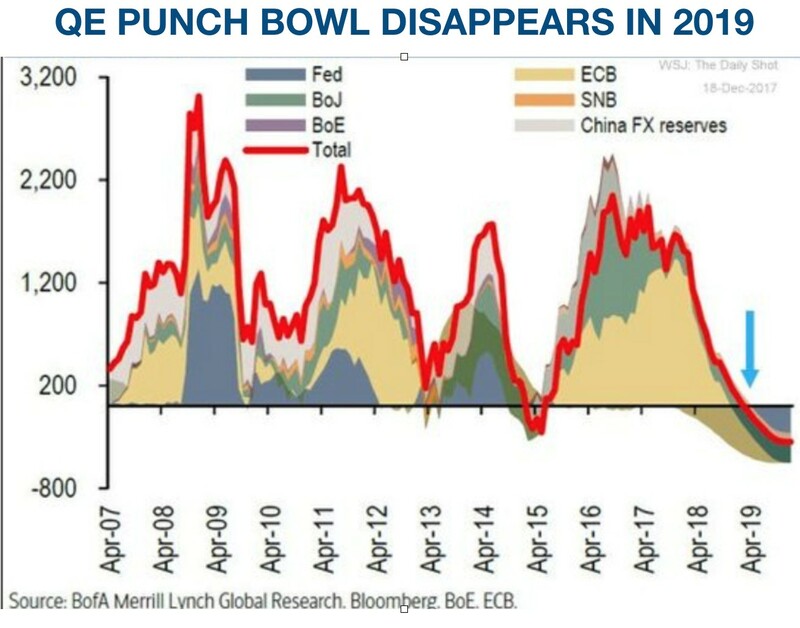 They are taking away the punch bowl that has fed all the asset and debt bubbles in recent years. It is not just the US where liquidity growth has reversed abruptly by the quantitative tapering. Also in the Eurozone, Japan, and China liquidity growth is slowing down significantly. This is all that is needed to create the perfect setup for the coming collapse. The bubbles will implode if they are not constantly expanding. Yes, there will be a point when stock and bond markets collapse and central banks will start wild money printing again. But since they are always behind the curve, it will all be too late and what the world economy will experience is a hyperinflationary depression that eventually leads to a deflationary implosion of the system. So what will be the initial specific events that starts the coming fall of the world economy? Will it be Japan’s economy sinking into the pacific, or the Chinese debt dragon catching fire or maybe some little boy who will proclaim that Uncle Sam has no clothes. The Brussels elite is certainly doing a superb job in destroying Europe both economically and socially. They will clearly cause the fall of the Rome Empire. Not that Italy is much of an empire these days. But just like all empires collapse under its own debt, so will Italy. With Italian debt to GDP the second highest (after Greece) in the Eurozone of 130% with Target 2 loans (Italian loans financed by Bundesbank via ECB) at Euro 500 billion, plus, plus plus, Italy will have no chance to even service its debt. The Eurozone QE has grown to Eur 2.5 trillion since 2015 and the ECB has virtually been the lone buyer of Italian debt. Yield on the debt has surged and many European banks are heavily exposed, especially the French ones. I suppose your scenario is always possible, but if anything, the last collapse was because the Fed printed too little money and the money it printed went to interest on bank reserves and not into the economy. The Fed was too tight. The Fed and banks in general tend to be procyclical, tightening in downturns. But they should be more countercyclical, unless their goal is to prune wages and speculation. Ok for the speculation but pruning wages weakens labor share of GDP. Continuing to to that could be a problem, which is why helicopter money would be a good thing if done properly.